If you are my facebook friend, you know that not too long ago, I received my order from Mountain Rose Herbs! It’s my treat to myself for being such a good girl lately. I have been pining to cook up some perfume! I ordered some amber/patchouli aroma oil that I had dreams of making a solid perfume of. Aroma oils are perfect for solid perfumes because they are made from resins and essential oils that are long lasting on your skin. Alcohol and chemical free, they make a wonderful natural alternative to commercially processed perfumes and colognes. Amber is a semi solid mass of tree resins and gums native to India with most of the raw material coming from the resinous tree Liquidamber orientalis. It is not harvested with that sensual aroma all on its own, but rather it undergoes a slight manufacturing process. 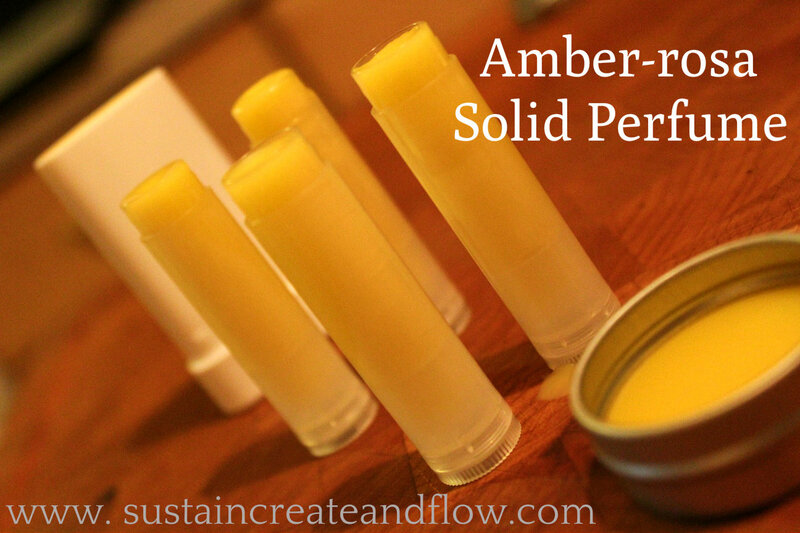 To get the finished product commonly referred to as Amber oil it is usually mixed in a base of beeswax and is combined with other essential oils and carriers. True amber resins should not contain artificial ingredients, petroleum by-products, or have any mineral base. (To learn more about Amber oil, click here). I had not heard of it before discovering it at Mountain Rose Herbs and I am so glad I discovered it! I love fossilized amber for healing and for adornment, but that type of amber this oil is not. The amber you are probably familiar with is Baltic amber, and that amber can be melted down into an oil as well, but is entirely different from this pleasantly scented amber aroma oil. When I think of solid perfume; I think of grandmas, lockets, and an overpowering scent of baby powder mixed with gardenia. So I must admit the idea of making some was a bit of a turn off, but I decided to give it a go anyway because the convenience of solid perfume is kind of irresistible! It was easy to make, and turned out wonderful! I want to share with you my recipe for solid perfume. 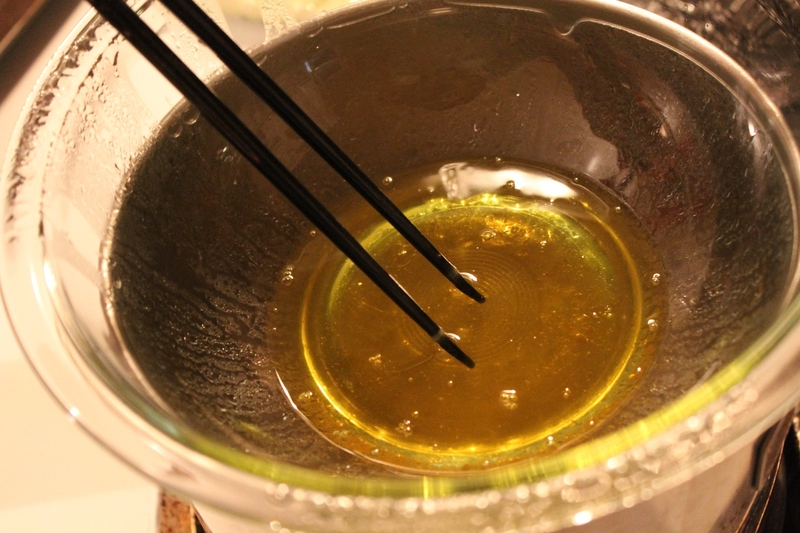 In a small double boiler, slowly warm all of the oils. 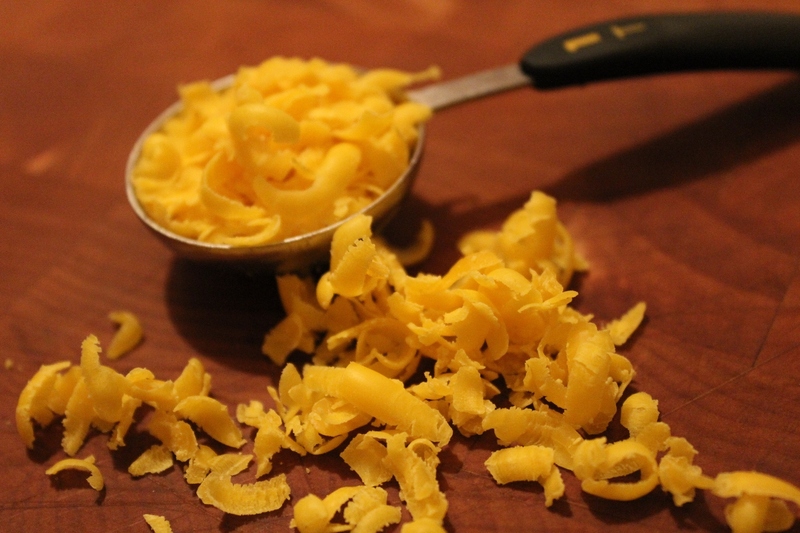 Add in the beeswax and stir until completely melted. (Chopsticks work great for this task!) Add in the vanilla extract and stir. Pour into small tins, a locket, chapstick tubes or other small tube of your choice. Allow to cool and harden before use. The scent of the beeswax is a lovely addition, lending the scent of honey to perfume. Our backyard beeswax is a very high quality, with a strong scent. I used vanilla extract (the cooking kind) to scent my perfume. It works great and is a more frugal option than the vanilla essential oil. Vanilla essential oil is actually an absolute, which means it was extracted in alcohol and is not 100 percent pure. The vanilla extract I get from my coop for cooking is not the same thing, but it is waaaaay cheaper and smells heavenly. And it works like a champ. I asked my sweet Husband how the perfume smelled and he said, “earthy and sweet, just like you!” Aw, thanks Husband! 🙂 Th scent is very well balanced and the perfume is not over-powering. Use it on pulse points or wherever you like to apply your perfumes. I like to think of solid perfume as a private perfume. The scent is just right and enough for me, but isn’t incredibly noticeable to others. It’s ease of use and portability are a huge bonus for me, since my favorite thing to do is “go somewhere.” It would make a great perfume for those who have sensitive workplaces and are conscientious about their perfume usage. 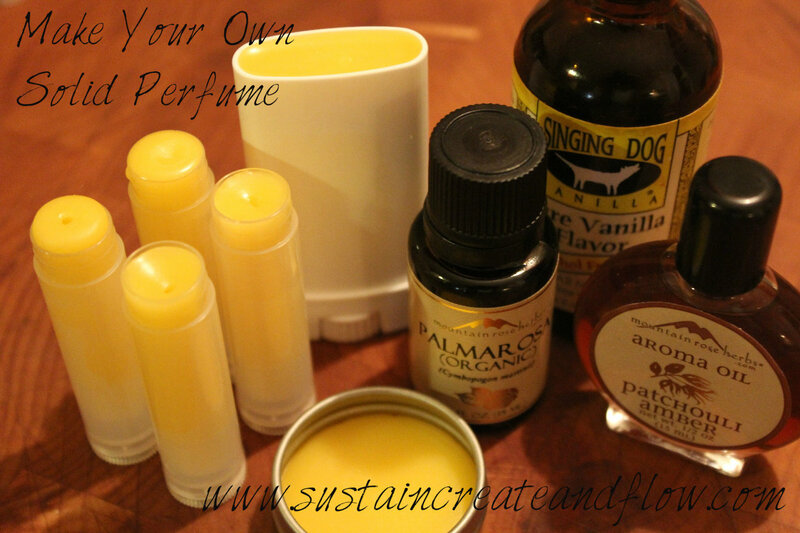 Use the 2 T oil : 2 T beeswax ratio, and add your own favorite scents. Here is helpful info on the blending of essential oils. 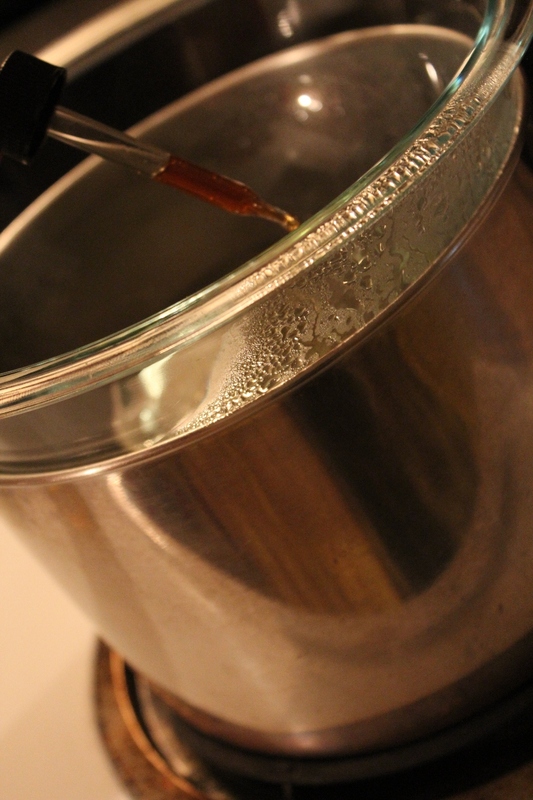 Have you ever made a solid perfume? What are your favorite essential oil combinations? Let’s chat about it in the comments below. And, the dialogue continues on my facebook page. I’d love to be friends! I love this. I have not tried solid perfumes yet. We have a link party called Wednesdays Adorned From Above Blog Hop and would love to have you share this and any other posts with everyone. It runs from Tuesday night through midnight Sunday. We also have a $50.00 Visa Gift Card Giveaway. Here is the link to the party. Thanks for pining! And, my husband is such a gem! 🙂 Have a great day, thanks for stopping by. Thanks, Monica! You’re really sweet 🙂 I am happy to help wherever I can. I’m a little behind in reading my e-mails, and this sounds wonderful. I’m thinking of trying it with my 2 favorite scents, lavender and rose.